The process is very simple. Once you place the order and I have received payment I will mail you a “Thumbprint Kit” with instructions. You take the impression and mail the kit back to me in the return envelope included in the kit. 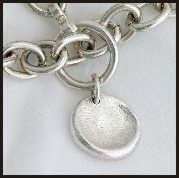 I then create your Thumbprint pendant form the impression you made and send the finished piece to you. All orders are custom one of a kind and therefore are not produced beforehand. Allow 2 to 3 weeks from the time the imprints are received by me. The pendants are made from the actual imprint that you return to me. The initials will be spelled as they appear on the order you return. Gift Certificates are available for $10. Please contact Angelprints at angelprintsjewelry@gmail.com or call 949.716.2382 to order. We accept Visa, MasterCard, American Express and personal checks (orders will not be processed until the check has cleared. This may take an additional 10 days). There is a $25 charge for returned checks. Payment is due in full at the time the order is placed. Prices are subject to change without notice due to fluctuations in metal prices. All applicable taxes will be charged. California residents will be charged 7.75% sales tax. Customers outside of California will not be charged sales tax. We ship within the United States. There is a $15 charge for standard shipping, handling & insurance. There is an additional charge for 2 day or overnight shipping. Larger orders may require additional shipping costs. Rush orders may also require additional shipping costs. If you are in another country we will determine the cost of shipping when you order. There is a $35 charge to re-mail another Thumbprint kit. All orders are custom made by hand and therefore not produced beforehand. Standard orders take 2 weeks from the time I receive the imprint back from you. Additional charges may be applied to rush orders. All orders are custom one of a kind, made by hand and therefore may not be canceled if they have entered our production system and may not be canceled after 24 hours regardless. All orders are custom one of a kind jewelry made by hand for you and therefore may not be returned. Each piece is hand made and no two pieces will be the same. The pieces are made from the actual imprint that you send us. The initials will be spelled as they appear on the order form you return to us. Please review your order carefully. If you are interested in carrying our jewelry in your store please e-mail angelprintsjewelry@gmail.com or call 949.716.2382.